Nikitis demands Kuroumaru address him as Nikitis-sama, so Kuroumaru complies. He then turns his attention to Touta, attacking him and thus “lending” Touta some of Nikitis’s power. Nikitis continues to easily cause Touta to be defeated. As such, Nikitis dismisses Touta as a fake, but Touta suddenly appears behind Nikitis and lands a punch through the shinso’s barriers. Touta continues to surprise Nikitis by landing blows on him. The two continue to obliterate each other, so Nikitis gives him a pass. With that, Nikitis decides to move to phase 2 of the training and shows how Touta can cause any kind of clothing to appear upon himself. Nikitis wants Touta to focus on appearance. Sometime later, Nikitis reveals he understands the trick Touta used to land blows upon his person. This method, whereby Touta uses his blood to simply regenerate anywhere, offends Nikitis. Nikitis asks why Touta wants strength. Touta explains that he wants to stop Ialda and help Eva. In the present, Fate’s head warns Touta that he failed to predict Nikitis getting involved. As such, he warns Touta that “they” are coming after Touta. Meanwhile, at the Senkyoukan, Jinbee and Gengorou react to an attack on UQ Holder HQ. Sept and Juuzou attack the pair, cutting both in half. 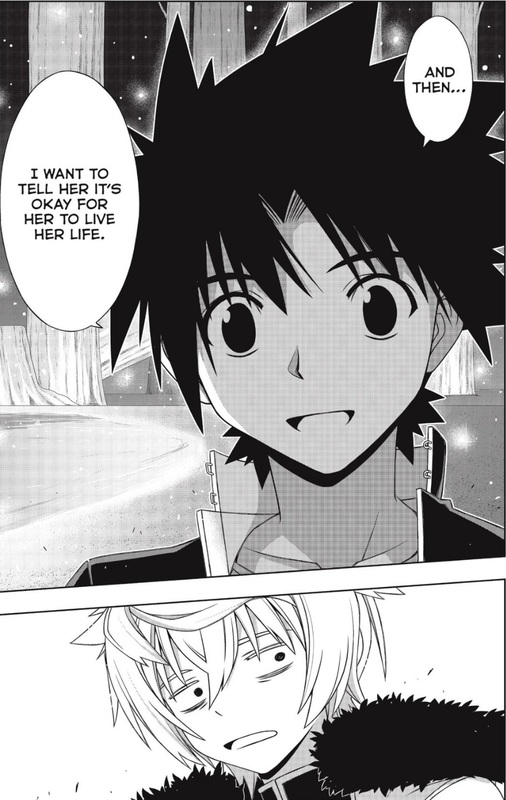 And so the odd tale of Nikitis in UQ Holder chapter 159 continues. To be honest, I have no clue what Nikitis is doing in UQ Holder chapter 159. He clearly dislikes Touta, yet during the three month training period, he built Touta up. Nikitis even has Dana’s fetish for wacky style. So if he wanted Touta dead, Touta would have been dead already. It is possible that Nikitis is bored and simply wants a bit of entertainment before dispatching Touta. I hope that’s not the case, but at the moment, it does seem to be the only logical thing. Otherwise, why would Nikitis attack Fate and put him out of action? One of the things that struck me about UQ Holder chapter 159 is how little there is in the chapter that seemed discussion worthy. With UQ Holder ending in the next 2+ years, did we have time to spend 19 pages depicting Nikitis pounding Touta until Touta came up with a counter? The fact that 35 total pages were burned on flashback isn’t a problem per se. Under normal conditions, I’d be fine with taking all the time needed to properly flesh out things. But I can’t help but wonder if while we burn this many pages now, we’ll ultimately end up with a situation where Akamatsu-sensei just has to rapidly shut things down ’cause there’s no more time. Since I can’t find anything really to write about, I’ll wrap up my review of UQ Holder chapter 159. So, what happens between Touta and Nikitis now? Is Nikitis working with Ba’al? Will we get some pages devoted to Sept and Juuzou and their backstory? In the end, UQ Holder chapter 159 is another chapter where the events in the chapter didn’t really jazz me that much. I’m not sure it is the content of the chapter, or me knowing that the manga’s end is approaching. What were your thoughts on the chapter? I’d love to read them in the comments. Since this chapter, like you said, is bare bones. I recommend that you watch this video essay. I’m heading to bed at the moment, so I’ll have to take a gander tomorrow. Please give this a watch if you can. One thing comes after another, you’d think Touta would just keep getting better to get to Ialda, but more obstacles are just being thrown in his way on his journey. Strange part is, it’s like Akamatsu is just throwing things out there and tries to give it backstory, and sometimes it may be because he is pressed for time. Kind of a dull chapter but the action scenes were good. Shame Kuromaru and Santa got relegated to peanut gallery. You’d think they would at least bust out their pactios. Oh well. I’m more or less resigned to this series being just okay. I’ll definitely take more of these over what we had pre-magazine transfer. I still hate that race with a passion. Yeah and the ending sets up something interesting for the next chapter at least. Though it does seem weird to introduce traitors this late into the series. Well, he had to start using the characters as he’d teased them in the first chapter. And the easiest way to explain why they’ve not been around all this time is that they are controlled or something. Nasty turn of events, which frankly i find odd that now these guys decide to make their move on Touta. Enemies within.